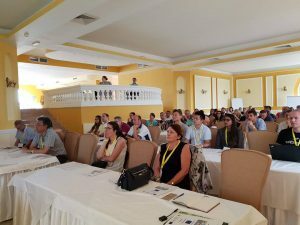 The 3rd Workshop “Advanced Materials“, organized within the H2020 project Materials Networking, took place from September 11th to 14th, 2018 in Duni, Bulgaria. The Workshop was attended by scientists from all four partnering organizations of the project, namely Faculty of Chemistry and Pharmacy, Sofia University, Bulgaria, coordinator of the project, University of Cambridge, UK, Max Plank Institute for Polymer Research, Mainz, Germany and the Faculty of Chemistry, University of Barcelona. Moreover, scientists from other research organizations such as Bulgarian Academy of Sciences, Queen Mary University of London, UK, University of South Australia, Mawson Lakes, Australia, Institute of Chemistry, Skopje, Macedonia, University of Melbourne, Australia, Wageningen University, Wageningen, Netherlands and University College London, UK also took part in the Workshop. The research topics presented at the Workshop covered a broad range of scientific fields all related to the advanced materials such as fuel cells, catalysis, smart materials, etc. 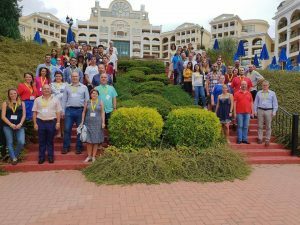 At the Workshop were presented 1 plenary lecture, 33 oral presentations and 14 short presentations. The plenary speaker Prof. Konstantin Neyman from University of Barcelona gave a lecture entitled “Density-functional modelling of nanocomposite materials for catalysis and new energy technologies”. The short oral presentations were an opportunity for young researchers from all partnering organizations to present their research activities. On 14th September, the Steering Committee of the project had a meeting at which it was discussed how the project progresses and how the project goals and targets had been achieved so far. Also, the plan for the project activities envisaged for the last year of the project was outlined and discussed.